The Assikura Championship got under way during the third winter meeting of the season held at the Marsa Racetrack yesterday. The first five heats from this championship, reserved for Class Gold trotters, were on the short 2,140m distance. The programme also included a Premier Class race which saw Lage, driven by Gozitan driver Marco Refalo, take victory. Twelve horses participated in the class Premier race. It was Zwack (Eric Bezzina) which made the fastest start, opening a small lead from Opal Hall (Tony Mallia) and Lage. However, with 500m to go, the early pacesetter ran out of steam and in the final straight got outsmarted by Lage which went on to secure its first victory after an absence of a year-and-a-half. Lage placed first ahead of Italian mare Madam Di Poggio (Julian Farrugia). Quobernador (Matthew Sammut) and Pike Blue (Mario Farrugia) followed home in that order. The winner clocked an average time of 1.17” per kilometre. From the five class Gold heats, 20 horses qualified for the semi-final stage. In the first heat, Nagano Phedo (Mario Fenech) upped its pace with 300m to go to secure victory. However this French trotter was later disqualified by the racing stewards and the win was awarded to favourite Starfirefinnfemfel (Julian Farrugia). As expected, favourite Lover Roc (Jurgen Attard) shot into the lead around 400m from the finishing line of the second class Gold heat. This Italian trotter continued to run untroubled till the end to notch its third consecutive win. Mont Cenis Honey (Clint Vassallo) was second. In the third heat, favourite Record Du Mexique (Marvin Cauchi) took the lead with a lap to go. However, in the final straight this French trotter had to go all out to gain its fifth win in a row from Prince Gaillard (Charles Camilleri). 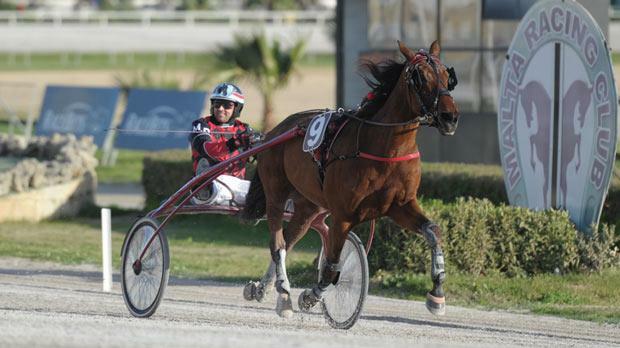 Another French trotter, newcomer Quito De Neret registered its first win in Malta in the fourth heat. Driven by Noel Baldacchino, Quito De Neret ran untroubled in the final straight to cross the finish line five lenghts clear of Troy Boshoeve (Salvu Vella). In the fifth and last class Gold heat there was a close finish between three trotters. Race judges had to consult the photofinish and victory was awarded to Pepone Du Castelet (Charles Camilleri) ahead of Quermes Rush (Noel Baldacchino). The next racing meeting will be held on Sunday, with the first race scheduled for 1.30pm.